The sparkling nature beauty was enjoyed by thousands of people on the Straits of Mackinaw these past two weekends. Photographers jockeyed for the best spots, families were taking photos and the bravest (or craziest) of visitors adventured out onto the huge mounds of ice located several yards from shore. Can you find the star in the photo below? I had to crawl down between huge ice boulders that were a foot thick to get this fun photo! I think it was worth it! The best place to park, in my opinion, is in Shepler's parking lot as the biggest and bluest ice chunks were located in this area. They definitely decreased in size as you neared the Mackinac Bridge. We took the photo shown below directly behind Shepler's. 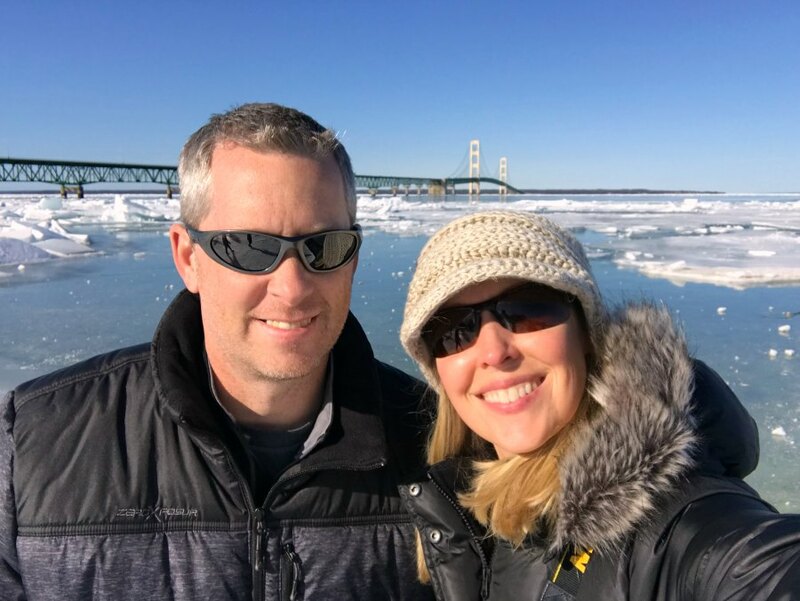 We really enjoyed walking along the shoreline, climbing over ice boulders and walking under the famous Mackinac Bridge. If the cold weather continues, thousands of people will flood the city this weekend to take photos, climb on the ice and soak in the beauty of this rare phenomenon. 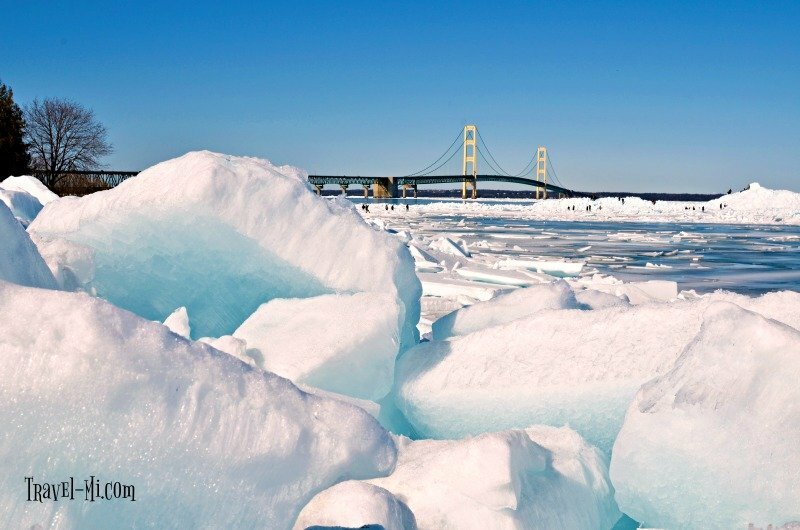 Did you know it has been seven years since Mackinaw City has experienced blue ice? I was positively giddy to get to the city and see it for myself!! We are LOVING the Blue Ice! Wear hiking boots with a good grip. The ice is very slippery and you will fall without good boots. We watched it happen A LOT. Be very careful if you decided to venture off the shore. There are hollow pockets under the ice and be very thin. The area is very muddy so don't wear your favorite boots you wear out or to work! The ice is VERY SHARP because the crystals are aligned vertically so the top of the ice boulders are very sharp. 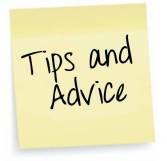 The edges of the boulders shear off very easily so be sure to place your hand or foot closer to the center so you don't lose your footing. See my photos of this here. 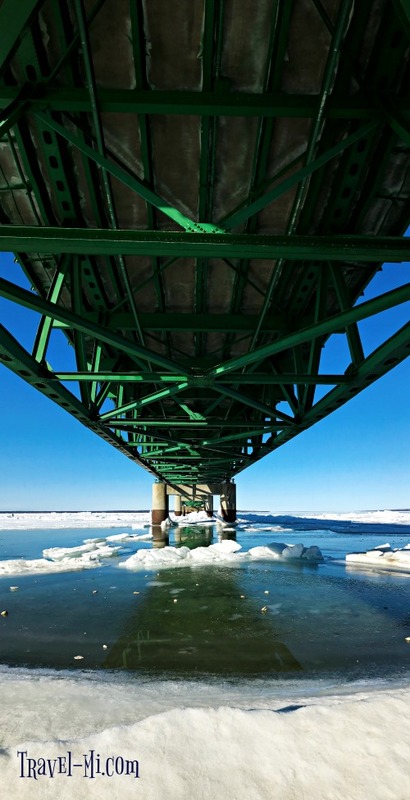 The ice isn't blue in this photo, but it's still a neat shot from below the Mackinac Bridge! It was our first time walking under the bridge so it was pretty exciting! 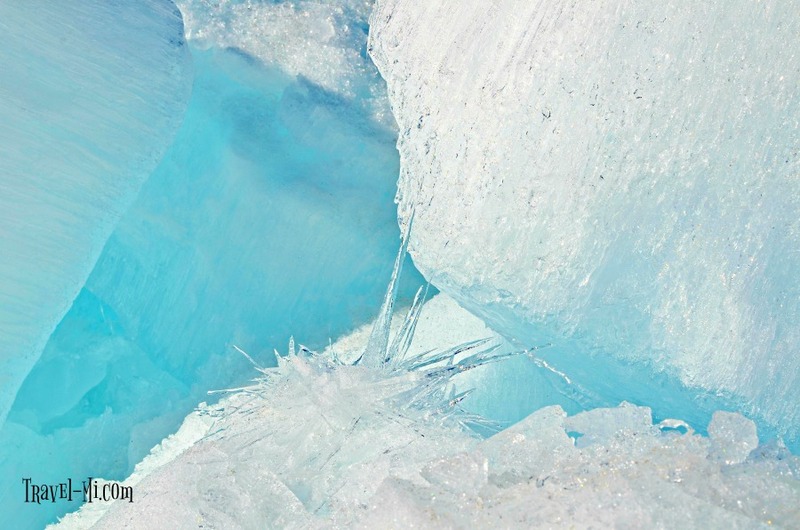 Please click here to see additional photos of the blue ice! We also took some awesome drone footage that we think you'll love!